In a short judgment Mr Justice Baker declined to award the Official Solicitor his costs after a CCG withdrew applications in relation to a series of test cases. You can read the judgment here. The case concerned applications in relation to the living arrangements of incapacitated adults for whom the CCG had responsibility. All were living in their own home and the CCG sought clarification as to whether such individuals satisfied the “acid test”. The CCG also questioned whether the responsibility for any deprivation of liberty was imputable to the state solely by virtue of the fact that it provided NHS care for P. If either the acid test was not satisfied or the arrangements were not imputable to the state, of course, the adults concerned would not be deprived of their liberty for the purpose of Article 5 and thus the CCG would not be required to make an application to court for a welfare order under section 16 MCA 2005. The Official Solicitor was invited to act for the four adults originally involved in the test case. Two were not eligible for legal aid and it was not considered reasonable to utilise P’s funds for this purpose. Subsequently one of these cases could proceed and the CCG applied to withdraw its application because the practical impact would be very limited; the CCG had reviewed its position in light of the OS’ analysis and the CCG considered that both the relevance and the strength of the application had been limited by the Law Commission’s proposed reforms. The Official Solicitor sought his costs, submitting that in reality the application was akin to a civil claim where he had succeeded. (1) I do not accept the suggestion that this was not a typical welfare case. The application concerned a series of welfare cases in which an important preliminary issue arose on a point of law. (2) As is widely recognised, the law concerning deprivation of liberty under the Mental Capacity Act is in a state of some uncertainty. That is why it has been the subject of a review by the Law Commission whose final report contains recommendations for substantial reform. The government has now accepted the report and the majority of its recommendations, and acknowledged that the current Deprivation of Liberty Safeguards should be replaced “as a matter of pressing urgency” (see government response 14 March 2018). (3) It was in my judgment understandable that the applicant sought guidance on the issue of the impact of the “acid test” on cases involving incapacitated adults living at home, given the large number of individuals in those circumstances for whom it is responsible. In the words of rule 159(2)(b), it was reasonable for the applicant to raise and pursue this issue. (4) Given the constraints under which all public bodies operate, the applicant was entirely justified in keeping under review the question of whether to pursue the case. Indeed, it would have been remiss if it had not done so. The fact that the applicant decided to abort the proceedings was a reasonable decision. To use the words in rule 159(2)(b) again, it was reasonable for the applicant to decide not to contest the issue in the light of developments in the litigation as described above. (5) Although it is arguable that the difficulties in the individual cases could have been anticipated, I do not think that the applicant’s failure to do so at an earlier stage could be described as litigation conduct of the sort to justify departing from the general rule. (6) Although my comments in G v E (Costs) above were made in a different context, they do have some relevance here. Professionals working in this field often face difficult judgements and decisions. The applicant made the decision to ask the court to consider the preliminary issue which, as Mr Ruck Keene fairly conceded, involved propositions of general and considerable importance. Subsequently, however, in the light of developments within the cases, the applicant decided not to pursue the issue. In all the circumstances, I do not consider that its decision-making and overall conduct justifies a departure from the general rule as to costs. Comment: This is a useful application of the principles concerning costs to an unusual situation namely where an important preliminary issue arises in a “typical welfare case”. Key to this was the judge’s assessment that it was reasonable for the CCG to seek guidance about the applicability of Article 5 given the significant financial impact in a time of financial constraints had the CCG been successful; but that it was also reasonable to keep the need for the proceedings under review and to seek to withdraw them when the issue, although fascinating, had become academic. Re JMK  EWCOP 5, HHJ Hilder, faced with two litigants in person, has taken an unfortunate wrong turn as regards the basis upon which ‘foreign’ (i.e. non English & Welsh) powers have effect in England and Wales. Two litigants in persons (the daughter and son-in-law of the donor) sought recognition and enforcement of a Canadian “Continuing Power of Attorney for Property” as a “protective measure” pursuant to paragraph 19 of Schedule 3 to the MCA 2005. It is not entirely clear from the judgment why they did so, although there is mention of a family legal battle, presumably in Canada. It is likely that there must have been some property in England and Wales that the holders wanted to administer and it can perhaps be assumed that they were having difficulty doing so without a court order. Although the judgment does not say where power was made, it notes that the power was headed “[m]ade in accordance with the Substitute Decisions Act 1992.” This suggests that the power was made in Ontario where, although it appears that this was not brought to the judge’s attention, a Continuing Power of Attorney for Property does not need to be registered before it takes effect, either with a court or with an administrative body the equivalent of the Office of the Public Guardian in either England & Wales or Scotland. There was no evidence of the donor’s capacity at the date the power was executed although there was evidence from the care home where she lived in Canada that she lacked capacity thereafter. The two parties before SJ Hilder were unrepresented, and she noted that she did not have the benefit of legal submissions. The only authority that she found on Schedule 3 was the decision of Hedley J in Re MN (Recognition & Enforcement of Foreign Protective Measures)  EWHC 1926, concerning a protective measure in the form of an order made by a California court. 17. […] reference to ‘protective measures’ in Schedule 3 is intended, and generally understood, to refer to arrangements that have been made or approved by a foreign court. It may not be spelled out explicitly but the language of paragraph 19(3) in particular confirms that intention and understanding: each of the circumstances in which the mandatory requirement can be disapplied clearly envisages court proceedings. I have not found any authority which casts doubt on that understanding. JMK’s Power of Attorney has been through no court process at all. It is not even subject to a system of registration. It therefore does not fall within the general understanding of the term ‘protective measure’ for the purposes of recognition by this Court pursuant to Schedule 3. SJ Hilder concluded by noting that it remained open to the applicants to apply to be appointed as property and affairs deputies in this jurisdiction. It is very unfortunate that SJ Hilder did not have benefit of legal submissions on this important issue, because she did not have her attention drawn to the fact that she was being asked the wrong question by the applicants, and that she should have been analysing the position not by reference to whether or not the power of attorney was a protective measure for purposes of Part 4 of Schedule 3, but rather by reference to the provisions of Part 3. As explained in more detail in a discussion paper I prepared some years ago here (paragraphs 31ff), the general rule is that powers of attorney which are valid according to the law of the habitual residence of the donor are directly effective in England & Wales. It is irrelevant, therefore, whether or not ‘foreign’ powers are also capable of being protective measures for purposes of Part 4 of Schedule 3, which was the focus of SJ Hilder’s analysis. The question was whether the Ontario power was valid according to the terms of Ontario law (assuming that JMK had been habitually resident there at the point of granting the power. The concept of the confirmation of powers must give every guarantee of reliability and be seen in the light of legal systems which make provision for this confirmation and place it in the hands of a particular authority, judicial in Quebec, administrative elsewhere. The first version of this report, which was based on a reading of the Convention text, set forth that this confirmation is not a measure of protection within the meaning of the Convention. If this indeed were the case, there would be no need to mention it alongside the measures of protection in Article 38. However, some delegations have since asserted that this analysis is not one which, according to them, flows from the discussion, difficult as it was. […] According to this view, a confirmation could constitute a measure of protection within the meaning of Article 3 and it could only be given by the competent authority under the Convention. A consequence of this might be that, if the adult has, in accordance with Article 15, paragraph 2, submitted the conferred power to an applicable law other than that under which the authorities have jurisdiction under the Convention, the representative risks being deprived of the possibility of having his or her powers confirmed, for instance, by the competent authority of the State whose law is applicable to the power of representation. In other words, the Explanatory Note makes clear that the intention underpinning the Convention – and hence Schedule 3 – is that registered power (for instance a Scottish power registered with the Office of the Public Guardian) may well be capable of an application for recognition and enforcement. That could never have benefited an attorney under an Ontario power, but the position may well be different in relation to many other types of powers. Importantly, however, it is equally – if not more – unfortunate that SJ Hilder did not have drawn to her attention the provisions of (at the time Part 24, but now Part 23) of the Court of Protection Rules, which provide in Rule 23.6 for a standalone application to be made in any case where there is doubt as to the basis upon which the attorney under a foreign power is operating. This is what the applicants in this case should have been seeking and the court considering, and it is the course of action I would strongly advise that any attorney under a ‘foreign’ power takes in future in the case of recalcitrant institutions in England and Wales. I would hope, further, that the opportunity arises swiftly for either SJ Hilder or another judge of equivalent or greater seniority to clarify the position with the benefit of submissions based upon the matters set out above. A dedicated multi-disciplinary group are working up a proposal for Court of Protection mediation scheme, and would very much welcome input from those willing to comment on the draft proposal as it stands, covering as it does (a) cases suitable for mediation; (b) when to mediate; (3) the mediators; (4) the scheme; (5) funding; and (6) evaluation of mediation. Please email Katie Scott (ks@39essex.com) if interested. Your help would be most appreciated by 3 April. The CoP forms have moved today (21 March) to the .Gov.uk website, and can be found here. In its detailed response, the Government has accepted, or accepted in principle, all of the recommendations except (1) the recommendation relating to a statutory codification of capacity law in relation to children; and (2) four areas which it has left for the independent Mental Health Act review to consider. 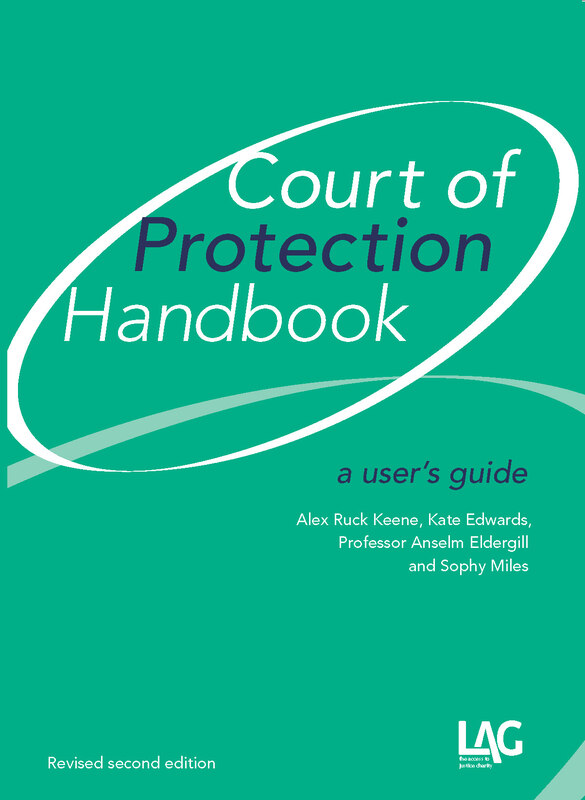 Court of Protection Handbook Blog at WordPress.com.